£32K IS ALL YOU'LL NEED to put a classy new A6 Avant on your drive  that will buy you a 2.0-litre TDI SE with a six-speed manual transmission and front-wheel drive; the expected best-seller of the A6 line-up. Two litres might not sound a lot to power a large load-lugger but the TDI turbodiesel has more than enough torque and power (280lb ft and 174bhp) to get the job done. 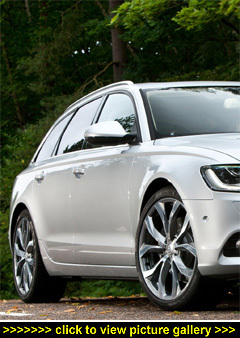 In this sector of the market kit is king and even this 'entry-level' A6 Avant model comes very well equipped as standard: SD-based SatNav, leather upholstery, dual-zone climate control, automatic lights and wipers, front and rear parking sensors, six airbags, Bluetooth connectivity, cruise control, Audi Drive Select, four one-shot auto up/down windows, electrically-adjustable and heated powerfold (on demand and on locking) door mirrors, powered bootlid, drive-off auto locking, auto-dim rear-view mirror, cooled glovebox, electric parking brake, stability control, 17-inch alloy wheels, etc  you get the picture. Physically sleeker and sportier, the all-new Avant exudes quality from the moment you step up to it. It's longer than its predecessor and uses the extra 70mm in its wheelbase, and it's extra width, to the benefit of its passengers. Sleek roof rails emphasise the sloping roofline and together with a discreet rear spoiler add a dash more kerb appeal. So, the all-new A6 Avant is wearing the right badge and the right clothes  but what's it like inside? Getting in is hassle-free  keyless entry and start is standard. For current Audi drivers it's sufficient to say 'It's an Audi'. For everyone else, you'll find the A6's cabin to be a step-up from any other car you might look at in this sector. Tasteful cabin trim and quality materials are combined with impeccable fit and finish  just check out the beautifully done satin chrome filleting and patterned aluminium trim. Everywhere you look the attention to detail is truly impressive. The fascia is clutter-free and the 3D-effect instrument display, controls and switchgear are not only smart but smartly laid-out. If you like your driver-aids there's a lot of options to choose from  talking-point items include a night-vision thermal-imaging camera system that picks out 'warm-blooded' road-users up ahead, a park assist system which automatically steers your A6 into a parallel or perpendicular parking space, and a head-up display that projects key data onto the windscreen. There's even a 'hands-free' opening system that raises the tailgate when you waggle a foot beneath the rear bumper. The shapely power-operated seats, upholstered in leather, truly are as supportive as they look; multi-adjustable, they offer particularly good shoulder support, extendable under-knee support and three-stage heating that warms every inch from shoulders to under your knees. And the height-adjustable centre armrest is wide enough to be willingly shared between driver and front passenger. The driver, in particular, is indulged with a wide range of adjustments  seat, seatbelt and three-spoke leather-wrapped wheel  so setting an ideal driving position is quick and easy. So is keeping it if you need to share the driving  a two-memory recall is standard. Other well-considered features include easily-adjustable headrests worked by buttons on their sides  so much easier! Managing the A6's on-board information and entertainment systems is equally undemanding thanks to Audi's Multi Media Interface. The controls for this are fitted immediately behind the gearlever and even self-confessed technophobes will find it a breeze to use. Basically, the main rotary control knob is flanked with four 'function select' push-switches. Using the MMI knob and these switches, the on-screen menus can be navigated and selected from  it really is the easiest driver-interface system on offer from any car manufacturer and lets the driver or passenger manage the audio system, Bluetooth and the SatNav (helpfully with full postcode input). A nice touch is the retractable 6.5-inch colour monitor that swings silently and elegantly out and up from the centre of the fascia when needed. Especially useful is the large, bright white digital speed display that can be called up on the on-board computer display dead ahead of the driver. There's a mass of information that can be easily selected and displayed and, importantly, the driving range is permanently shown. Back seat passengers don't miss out on the best seats. As in the front, there's room in all directions and legs can be stretched. Two lounging in the back will tell you that four is the preferred number but to be fair, it's a full five-seater  three adults in the back is doable if, that is, you have the blarney to persuade the other two rear passengers to share. Rear passengers also have their own AirCon controls, a well-padded centre armrest with a large lidded tray and cup-holders built in, usable outer armrests and a decent seatback angle. Although the upper window-line slopes noticeably, the actual roof doesn't so there's far more room inside than appears from the outside. With the rear seats occupied, the boot measures a pretty commodious 565 litres; fold down the quick-release rear seatbacks and the load bay expands to a very businesslike 1,680 litres. And that should be more than enough to satisfy the average family unit's lifestyle requirements. For the record, the rear seatbacks don't fold absolutely flat (there's a slight incline at the front end of the load bay floor) but it's not a problem. Clearly much thought has been expended on maximising the A6 Avant's carrying abilities  the load bay has side restraining straps, bag hooks, a double cargo floor and a dirt-resistant tray. Also provided is a customisable rail cargo management system with adjustable horizontal dividers, moveable tie-down eyes and multi-use elastic nets. Accessing the load bay is easy via the power-operated, high-opening tailgate. The loading sill is just above knee height, protected by a smart ribbed section of polished aluminium. Other likeable touches include a luggage blind that rides up as the tailgate rises. Expected to be the choice of 75% of all A6 Avant customers, the 174bhp 2.0-litre turbodiesel gives a very good account of itself, powering the front-wheel drive wagon to 138mph (where legal, of course) and getting it off the line to 62mph in 9 seconds. And no diesely noises! The 280lb ft of torque (on tap from 1,750rpm) keeps it lively throughout the rev range while also keeping it pretty quiet  most of the time you wouldn't know it's there. And it's deceptively pokey: you can be wafting along at 50mph and the next time you look the speedo is showing 80mph. All with no fuss; and no telltale from the exhaust. In-gear pick-up is very good on motorways, where the 2.0 TDI proved to be very relaxing to travel in. Start-stop (you can turn it on/off at any time) and energy recuperation, along with an innovative thermal management system that quickly brings the coolant and oil up to operating temperature, are fitted to minimise tailpipe emissions and maximise fuel consumption. Talking of which, our test average for a hard week's driving, that included a lot of town work, was 41.5mpg (officially 56.5mpg for the combined cycle). Less heavy-footed drivers should be sure to do much better than we did. The six-speed manual 'box is fitted with a well-stacked set of ratios, topped by a long-legged, fuel-saving sixth gear that makes for refined and unruffled cruising at speed (definitely one of this A6's core strengths) and which, thanks to the torque, minimises change-downs. Not that you'll mind changing gear because the six-speeder has a polished shift action and is a pleasure to use. On the move the Avant feels assured and secure whether you're on Broads or motorways. If the former, you'll find it grips well through the twists and turns. And it rides well, too, even on the 10-spoke 18-inch alloys fitted to the test car. The Bridgestone tyres  big, wide 245/45 profile  are grippy and benefit ride comfort. Overall, the Avant serves up a well-balanced mix of handling and comfort that makes for a pleasant drive at any pace you care to set. The A6 uses electromechanical power steering to help economy: it feels weighty enough, is quick to react and steers fine. Adding to the Avant's reassuring character are good powerful brakes (hefty callipers up front on vented discs; solid discs at the rear) that operate without you really noticing: push and you slow or stop without drama, and as severely or as smoothly as you wish. The new A6 Avant's body is significantly lighter than it might have been (by around 70kg) thanks to the amount of thinner but lighter high-strength steel, aluminium outer panels and lightweight suspension components. Together these make it 15% less heavy than an all-steel equivalent. Dynamically this improves agility  and palpably so. Body-roll is noticeable by its absence and, given its size, the Avant feels well balanced and nimble, and delivers an enjoyable combination of C 'n' C: control and comfort. While air suspension is another option, you can save yourself £2,000 by sticking with the standard steel coil spring set-up that the 2.0 TDI SE rides on. They do a decent enough job of smoothing out the UK's poor blacktop  and the driver also has Drive Select to improve things further. Included at no extra charge, Audi's Drive Select lets the driver fine-tune the mix of steering and throttle responses (on autos the gearshift points are also modified) at any time while driving. Choose from Comfort, Automatic and Dynamic  all three modes do exactly what they say.